The Six Day or June War of 1967 was a time when Israel decisively defeated Egypt and asserted its US-buttressed hegemony in the region. Nasser was threatening to drive Israel into the sea. Instead the Arabs were humiliated and the Israeli army, the IDF, seized large hunks of new territory in many directions, including Jerusalem, Gaza, Sinai and the West Bank. They evacuated Arab towns and drove the inhabitants out, creating refugees (they had done this before, to found the State of Israel). Israel was triumphant -- and enlarged. The occupied lands have never been returned. In another in a series of searching recent documentaries critiquing Israel's history and politics, the presumed righteousness and beauty of this 1967 war is questioned using remarkable documents -- recorded interviews with Israeli soldiers two weeks after the War, 70% of which, we're told, the IDF have previously suppressed. (Hence the title, "Censored Voices.") The interviews were made by two kibbutzniks, writer Amos Oz and editor Avraham Shapira. Mor Loushy, a 33-year-old Israeli woman, has made this film because her generation has never been exposed even to the pared-down form of the document. As the old reel-to-reel tapes are played, we are shown some of these soldiers as they are today, sober old men sitting stolidly and listening, those images intercut with a wealth of archival footage of the war and its aftermath (including US TV news reportage) edited to illustrate what's being said and evoke the moment. Contemporary commentary is limited: only a handful of the veterans briefly characterize themselves as they are today. No authorial voice relates the material to a wider historical context. 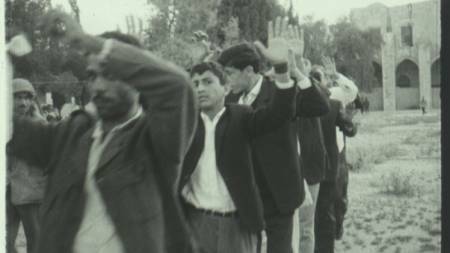 But if the result isn't as surprising or as searching as some other recent Israeli documentaries, like Ra'anan Alexandrowicz's The Law in These Parts or Dror Moreh's The Gatekeepers, Censored Voices nonetheless provides raw material for a sobering and honest look at Israel's past and future. The interviews, though formerly much pared down, and originally intended only for Kibbutzim consumption, wound up being widely published and became very familiar to the Israeli audience, as a recent article in Haaretz explains. Oz and Shapira went out recording voices because they knew that, despite the national jubilation, the feelings of returning soldiers were more ambivalent than joyful, and they had a need to vent them. Maybe the war was necessary, they say, and they certainly are more than glad they won it and not the reverse. But some say how unready they were when the time came, admitting they'd much rather have stayed at home. They report astonishment, in the event, at how coolly they participated in firefights, as in a shooting gallery. They recall taking pictures of dead men as colorful trophies and oddities; they were unused to war. They were shocked to see prisoners being executed by their own. They felt regretful about civilian casualties and the wholesale permanent uprooting of Arabs from their villages. One recalls that they had done this before, to establish the State of Israel. Some see themselves as creating another shoah (Holocaust). Presciently, they say this is not the last war, not a solution, only a beginning of many more similar events: they will be dropping bombs every ten years. One soldier says he rejoiced at killing an Egyptian officer, because he was the enemy, then found snapshots with his ID that showed he had killed a young father. There are many doubts about actions of the war, such as whether it was wise to have conquered and "reunited" East Jerusalem, and a refusal to rejoice at recapture of the Western Wall in Old Jerusalem, which one says isn't worth the "fingernail" of a lost young soldier. Though meant originally only for distribution in the kibbutzim, the Haaretz article says, the 286-page book compiled from the 200 hours of tapes recording testimony by 400 veterans from multiple kibbutzim, titled The Seventh Day, was widely published in October 1967. It came, obviously, in stark contrast to the songs and documents universally celebrating the victory. The refusal to rejoice was seen by some Israelis as proof of their nation's moral superiority. But others thought it disgusting, "sanctimonious, or miserable wailing," and nicknamed the book "Shooting and Crying" -- evoking a picture like Lewis Carroll's "The Walrus and the Carpenter," in which the pair sob for the oysters they have consumed and will consume. The recorded 1967 Israeli soldiers were doubtless more educated than the Egyptian ones and show a sophisticated awareness. But do their moral reservations make them superior to any other soldiers who go and kill people, destroy towns and villages, and create hundreds or thousands or millions of refugees? The Seventh Day had faded from collective Israeli memory in favor of a more triumphal and upbeat narrative. Loushy came across the book while taking a history course and was surprised and shaken by it. Eager to bring the original material to light again through a film, she succeeded in persuading Avraham Shapira, who had control of the original tapes, to release all of them to her for perusal. She and her partner and coauthor, Daniel Sivan, are responsible for their editing-down of the 200 hours to this brief run-time. She is perhaps wise to have omitted talking heads and elaborate explanations; but the mere images of the kibbutznik soldiers today sitting and listening, with only a flicker of a reaction from time to time, is a bit of a disappointment. One saying he is more right wing now and another saying he completely rejects Zionism -- that's not very enlightening. As Ben Kenigsberg says in his Variety review of this film, the present-day veterans' lack of emotion as they are filmed sitting and listening "may or may not be a stylistic choice." This leaves the technical work of the documentary more rudimentary than it might have been. But what's here provides much food for thought and discussion. If this and other searching recent Israeli documentaries are primarily made for Israelis, they turn out to be nonetheless important to students of world politics. And this film, with its disarmingly honest voices of ordinary men forced to take arms in a dramatic conflict, brings up issues of war and nationhood that are fundamental and universal. Censored Voices is now showing in an exclusive engagement from 8-14 January 2016 at Landmark's Opera Plaza Theater in San Francisco. Censored Voices, 87 mins., debuted in competition at Sundance Jan. 2015; also in Feb. in the Panorama section of the Berlinale. It opened in New York 20 Nov. 2015 and was covered in the NY Times. Directed by Mor Loushy and written by Loushy and Daniel Sivan based on The Seventh Day: Soldiers' Talk About the Six-Day War, edited by Avraham Shapira. Camera (color, HD), Itai Raziel, Avner Shahaf; editor, Sivan; music, Markus Aust; sound, Stefan Korte; sound designer, Yoss Appelbaum; visual effects, Nimrod Eya.